In order to ensure a pleasant experience for campers and hikers, here comes the magical instant tents. These are incredible mini shelters to let them unwind and gear up for more hectic journeys. 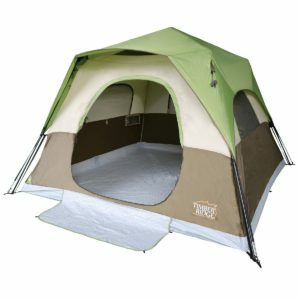 Be it during daytime or overnight, these tents can be set up anywhere in just two minutes and requires no effort at all. There are two types of instant tents – one is Instant Cabin Tent and the other one is Instant Dome Cabin. 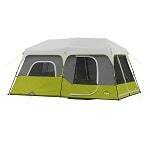 Where an Instant Cabin Tent is more popular and weighs less, the Instant Dome Tent is known to be quite sturdy. Different instant tents come with different capacities to accommodate people. So, prior to choosing the best instant tents, make sure you know about its capacity, quality, durability, and ability to ensure protection. While choosing a good quality instant tent, what matters is its fabric, and this further determines its level of protection. With this 4-person Instant Cabin Tent from Coleman, you can now have this assurance as it comes with a premium-quality polyester body. What’s best is that it does not take even a minute to set it up. 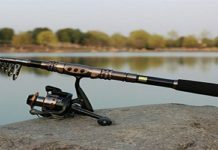 As it already comes with pre-attached poles, the installation process will seem to be a child’s play. Equipped with inverted seams, this instant cabin tent comes with genuine welded floors and hence keeps users away from falling prey to water hazards. For allowing additional airflow, it comes with a built-in vented rainfly. Easy on the pocket, this instant tent is sure to keep campers happy. Bid farewell to your worries of looking for a shelter to accommodate a big team of hikers with this Instant Cabin Tent from Core. 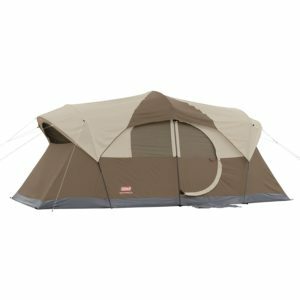 With a capacity to let 9 people sleep together, this spacious instant tent has a center height of 78 inches and can even fit a couple of queen air mattresses. What makes it stand out is its exclusive H20 Block technology that ensures full-proof protection against any uninvited entry. With an adjustable ground vent, it comes with a room divider as well as wall storage pockets. Additionally, it comes with a port for connecting an electrical cord. A big team of campers can, therefore, consider it any day anytime. If you have been in search of an all-season tent that can be put to use for diverse purposes, just take a look at this double-layer, 3-people instant tent. 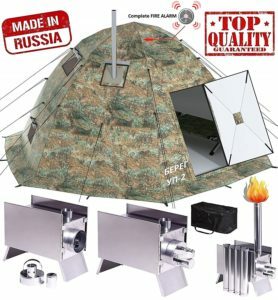 This multipurpose tent from Russian Bear it is unlike those typical ones as it comes with a plethora of outstanding features that hikers would love to know. To start with, this is an incredible shelter for campers to keep a distance from the wintry chills. Where its doors and windows are all equipped with mosquito nets, its flooring has been made waterproof. One of its unique features is that it includes a safe wooden stove that lets you dry clothes in quick time. Those who prefer hanging out outdoors are sure to fall in love with this fantastic instant tent. Imagine the experience of sleeping on a cozy queen airbed after a tough hiking trip with your loved ones. 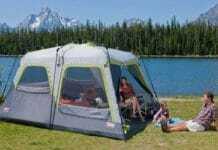 Now be ready to have a similar experience with this 6-person instant tent from the house of Coleman. Apart from keeping you cozy, it promises protection at its best for its exclusive Weather-Tec system and 150D heavy-duty polyester fabric. With an airy interior, it has dimensions of 10 x 9 feet and a center height of 6 feet 2 inches, keeping it hassle-free to walk around. 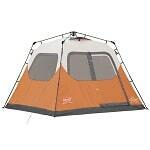 Be it taking down or setting up, this tent can indeed be unfolded in a few seconds. So keep no more dilemmas and buy this fully-taped, best instant tent at an economical price today. Technology blended with style and convenience is what campers are now going to witness in this compact yet spacious Coleman Weather Master. Quite trendy and pleasant to look at, this 10-person tent has been given a 450mm PU coating and 75D polyester fabric to confront bad weathers. With ample space to fit three queen size beds, this cabin-like tent has inverted seams along with welded floors. Accessibility is never a challenge as it has a zippered back door and a hinged front door. Also, the four little storage nets located at each corner of the tent will help you keep small miscellaneous items. In other words, Coleman Weather Master will just be perfect for a big family willing to hike around. Did you ever imagine technology to reach so far that it would build a tent, which could be installed in just 10 seconds? Coleman has done it by bringing this 4-person instant tent that would also safeguard your team of hikers from dire straits. No matter where is your campsite, just place it there and unwind inside it with your chocolates and sandwiches. Being fully taped, it has been crafted out of polyester taffeta and can be kept on even soaked grounds. Its foldable and sturdy and has a fiberglass pole. 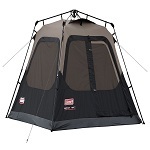 With a pre-assembled frame, this instant tent involves no effort to set it up. So, if you have a little team of four, your investment will not go wrong with this best instant tent. 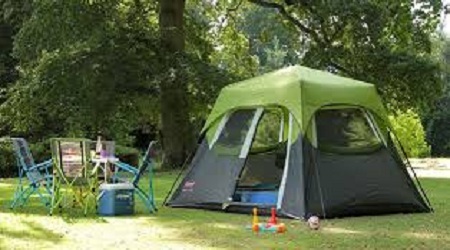 Put a stop to your frantic search for an instant tent and gear up for the most awaited camping tour with your family. Timber Ridge is here with its 6-person cabin tent that will finally add a pleasant note to your camping journey. With zero hassles of assembling, this modernized tent has a quick unlocking system that lets you set it up in seconds. One of the best things about it is its smooth entry and exit as it has a large door of circular shape. Besides, the 3 zipped mesh windows allow proper ventilation for the users inside. With a base measurement of 10 x 10 feet, it makes ample space for six people to sleep and does not make them feel congested. Easy to carry, this 6-person tent will always be a smart choice for a happy camping family. 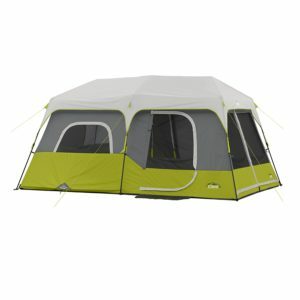 How to Choose the Best Instant Tent? Imagine you are already on a hiking trip with your backpack full of food, water,and chocolates. Suddenly, you discover that you have left behind your sleeping necessities and the sun is about to bid farewell for the day. So, what can actually save you here is an instant tent. Convenient, lightweight and easy to set up, these new-age tents are brilliant alternatives to those poles and stakes. You just wink your eye and your tent is ready in minutes. But one who is new to instant tents might find it a challenge to choose the best one. Capacity of people sleeping the tent – Determining a tent’s capacity is very important because you need to buy a tent as per the number of people sleeping under it. If you have a team of four and you end up buying a size for accommodating two, things will not work out. On the other hand, if you are considering a tent for six people, a wise idea would be to go for the 6-person instant cabin tents. Ability to handle weather conditions –The seasonality of a tent is quite crucial. If you are camping at a new place, you might be unaware of its weather conditions. Accordingly, you must check whether the instant tent you are going to buy has the ability to withstand harsh weather conditions. So, you can choose between two-season, three-season or four-season tents. Where the two-season tents will be best for summer and spring camping, the three-season tents will be suitable for spring, summer and autumn months. The four-season tents ensure to keep users away from odd weather conditions all year round. Process to set up – One of the biggest advantages to set up an instant tent is that it takes no time at all. 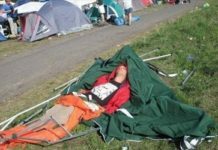 Just after you have got the right spot and acquired proper space, instant tents will not even take five minutes to set up. So, just check once whether the instant tent you are going to buy is easy to open up. If you find giving a little effort in opening it, just step back and look for another one. Light in weight to carry elsewhere – If you are planning to hike around for more than a day or two, you might have to load up your backpack. 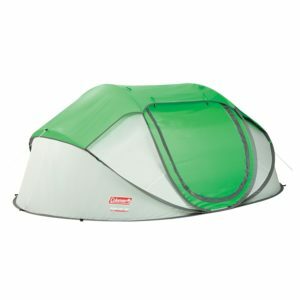 Now, if you buy a heavier tent, just imagine the inconvenience you will face while climbing up those tough sand cliffs. So, the best strategy is to always go for a lightweight instant tent that would take less space in your baggage. The lesser the tent weight, the more portable it is. 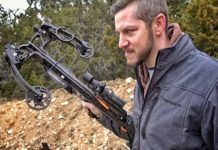 How many types of instant tents are there? 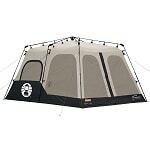 In general, there are two types of instant tents – Instant Cabin Tents and Instant Dome Tents. Where Instant Cabin Tents are lightweight and more spacious with windows just like you have at home, the Instant Dome Tents are sturdier and therefore quite stable enough to ensure a high level of protection. However, both can be set up in quick time and they also hardly differ in price. How are instant tents set up? The best thing about instant tents is that they are not required to be assembled separately. Everything comes preassembled. Since the body and frame of the tent are always linked to each other, you just need to unfold it and allow the tent to elevate one way or another. How many people are required to set up an instant tent? Instant tents are also known as pop-up tents Therefore, they do not usually require more than one or two people to set it up. Once it is unpacked off the cover, it would not even take 2 minutes to set it up. How expensive are instant tents? Instant tents are not that expensive. However, what their price depends upon are their quality and accommodation. For instance, family camping tents might cost a bit in comparison to one for an individual or a couple. Do instant tents ensure protection against bad weather? In comparison to traditional tents with steel poles and thick fabric, instant tents are quite light in weight and a bit fragile. However, if you are willing to carry one for a daytrip, it would serve your purpose. For overnights, however, you have to examine its quality, durability,and safety. So, you are finally ready to set out with your backpack. Just what you are left with is an instant tent. Well, by now you must have been a bit more knowledgeable about the type of instant tent to be taken along. Once you know how many members are joining your team, you will certainly have an idea about the space required inside the tent. Examine the quality of the tent, check its flexibility, see whether you can open it up faster, compare the price and make a deal for the best instant tent.